With regular medical exams, glaucoma can be detected early on and treated to prevent vision loss. At Papale Eye Center, we offer glaucoma screenings, as well as both non-surgical and surgical glaucoma treatment. To prevent loss of sight from glaucoma, contact our Springfield, Massachusetts eye surgery center today to schedule a comprehensive examination with our specialists. Glaucoma is a disease of the optic nerve that can cause complete loss of vision if left untreated. In the United States, glaucoma is one of the leading causes of blindness, especially among older men and women. Simply put – glaucoma is caused by a build-up of excess fluid in the eye. When this clear liquid is blocked and cannot flow out of the eye, pressure in the eye increases to the point where the optic nerve can become permanently damaged. The optic nerve is responsible for sending images to the brain, and if the nerve is significantly impaired, partial or total loss of vision can occur. In its early stages, glaucoma may produce blind spots and blurred vision, or no symptoms at all. 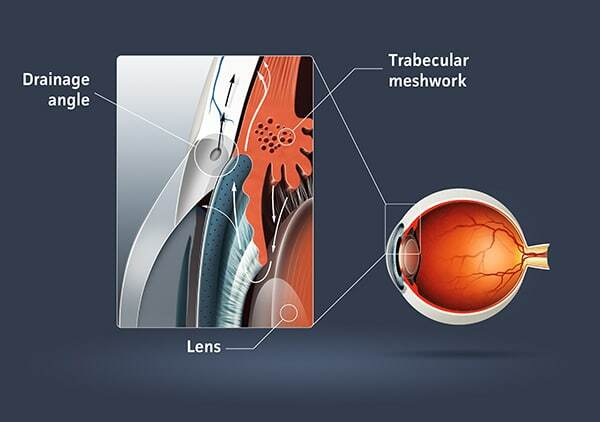 In many cases, by the time vision starts to become affected, glaucoma has already progressed to an advanced stage. Because glaucoma is often asymptomatic, it is important to undergo a thorough screening if you are at risk for developing the disease. To schedule a glaucoma screening, contact our office in Springfield, Massachusetts today. Though glaucoma tends to mostly affect men and women over the age of 40, age alone is not the only risk determinant. There are a variety of criteria that can be used to predict susceptibility to glaucoma, including family history, race (African-Americans are at an increased risk of developing glaucoma), and past eye disease or trauma. Certain medical conditions (diabetes and hypertension) may also increase your risk of developing glaucoma. If you meet any of these criteria, it is in your best interest to schedule an eye exam and glaucoma screening. Our ophthalmologists may recommend that certain at-risk patients return regularly for follow-up glaucoma exams at our Springfield, Massachusetts eye center. Who is a good candidate for Glaucoma Screenings? If diagnosed early, glaucoma can be effectively controlled with non-surgical or surgical intervention. At Papale Eye Center, we recommend that anyone who falls into the at-risk category for developing glaucoma visit our office for an initial screening, as well as regular follow-up appointments every year or so. For those individuals who are over the age of 40, a glaucoma screening every two to three years should be a regular part of their preventative health program. The screening itself will require a thorough, but non-invasive eye examination – patients will have the following tested and measured: eye pressure, peripheral vision, optic nerve, and eye drainage. Different types of glaucoma will require different treatment. At Papale Eye Center, we offer both surgical and non-surgical glaucoma treatment. When patients first visit our office in Springfield, Massachusetts for a glaucoma screening, our physicians may recommend eye drops or oral medications to relieve pressure within the eye. When drainage is an issue, SLT laser surgery can also be used to improve the flow of fluid. In certain cases, eye surgery may be necessary to prevent damage to the optic nerve. Surgery is generally reserved for cases where the disease cannot be controlled with medication and laser treatment has already been performed or ruled out.